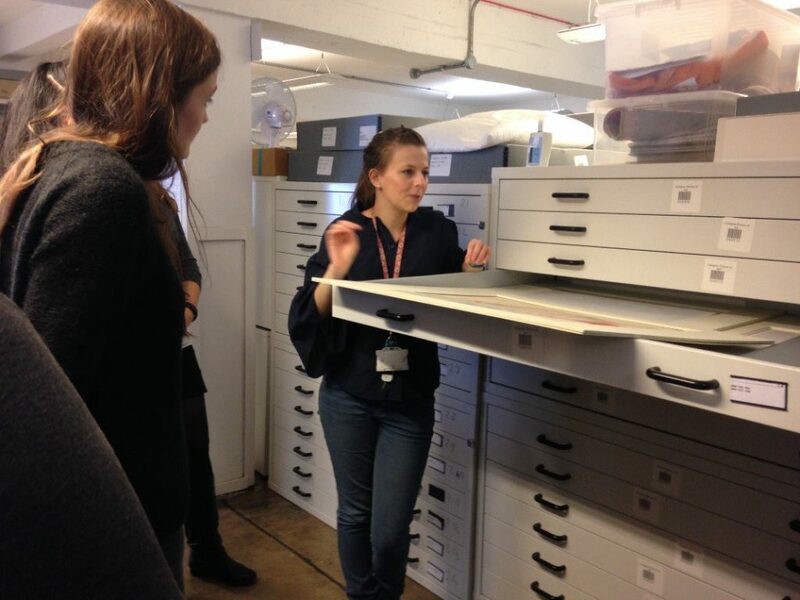 Michelle Kaye, Collections Development Officer, Archives and Collections, started by giving us an overview of the archive and collection, which was far more extensive and wide ranging than any of us had imagined. Dating from the School’s foundation in 1845, the collection includes 2,500 finished artworks dating from the mid-16th century to the latest degree show. It was a real treat to be able to get a close up look at the textiles Michelle had brought out for us – an eclectic group which well represented the diversity of the more than 400 pieces in the textile collection, including a 17th century stumpwork picture, a Chinese dragon robe, a Jessie Newbery embroidery, and a 1980’s Fraser Taylor printed shirt. Michelle’s presentation also addressed the reason for their temporary relocation to The Whiskey Bond, the fire in the GSA’s Mackintosh Building in May 2014. The fire was a sad and shocking incident , not just for the staff and students of the GSA, but for all of Glasgow, and Michelle skilfully articulated the rapid and pragmatic response to the disaster. It was, of course, a defining moment for the archives and collections and initiated a 3 year recovery programme of conservation, collection management and collection development work to stabilise and rebuild the holdings. Although the textiles mercifully escaped the fire, they were subjected to some water damage, and the only recently completed custom packaging sadly needed to be sacrificed. 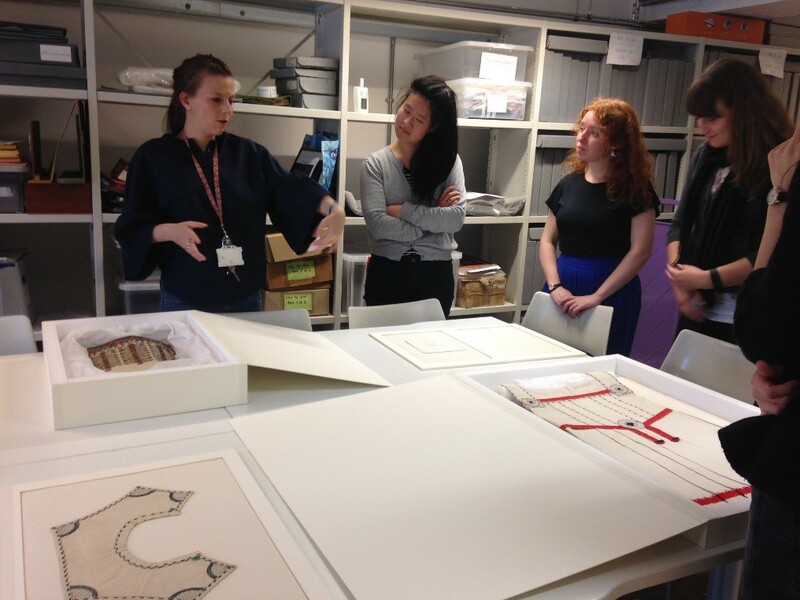 Michelle explained that the textile collections are used by both scholars and students for research and inspiration, and as a result, accessibility was central to the rationale behind the re-housing of the textiles. The team undertook extensive research to develop the most up to date and cost effective modular storage method, whilst also undertaking a thorough, number crunching survey of the collection. The resultant strategy uses folders for flat textiles and trays for 3-dimensional objects, with four different sizes of each being standardised to fit the storage drawer units. Rollers of three sizes will also be used. All materials are conservation grade and constructed to a high standard of finish. We went through to a project workroom for the ‘big reveal’ and were all bowled over by the end results, which are both simple and sophisticated, supportive but unobtrusive, economic and very cleverly modular. The new packaging is now being received in batches and the team have the very satisfying job of putting the objects into them, ensuring both their long-term preservation and their on-going accessibility. 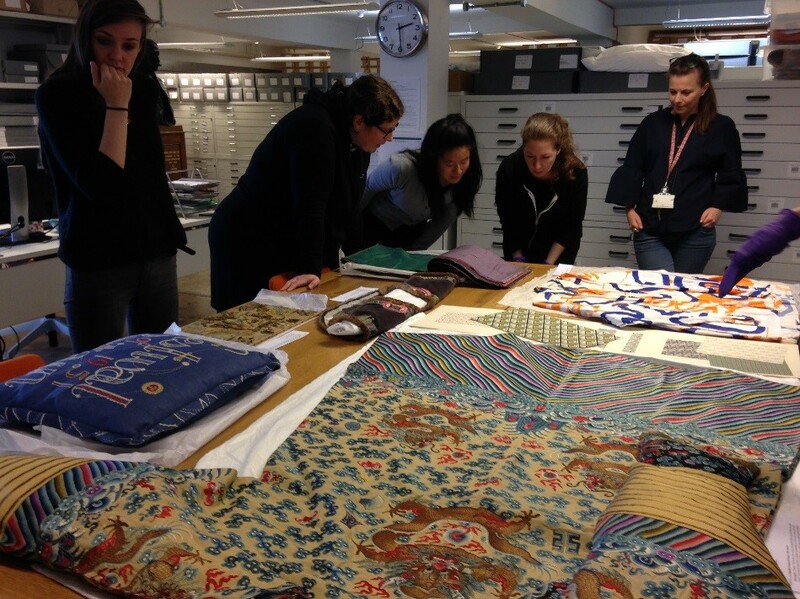 Reblogged from the textile conservation course blog. 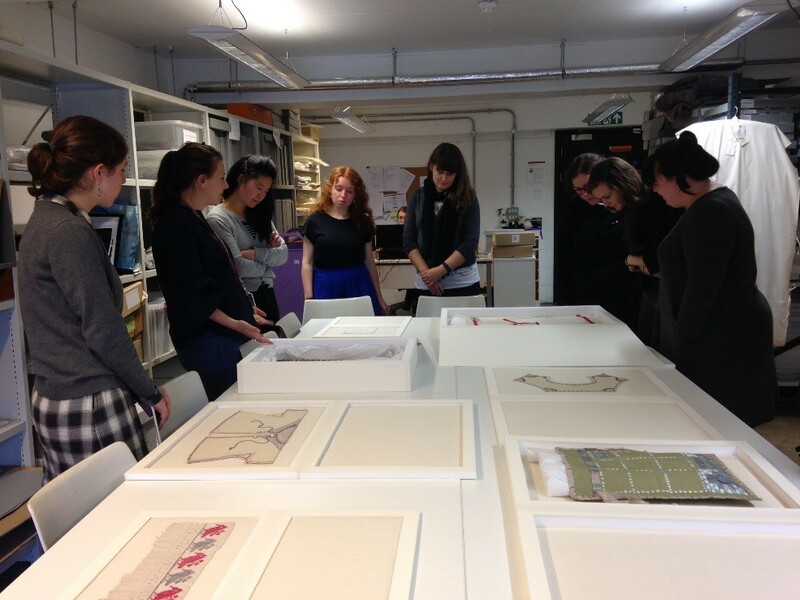 Many thanks to the students and to their lecturer Sarah for visiting!